Electric vehicles can be great for saving money on gas and for helping the environment! In California, driving an electric vehicle reduces GHG emissions by as much as 80% per mile traveled. UCI hosts fueling stations for electric vehicles in each of its four parking structures and several parking areas throughout campus. EV charging payments contribute to the purchase, installation, and maintenance of the electric infrastructure. All charging stations on the UCI campus use the ChargePoint network and you must be a member with ChargePoint to use the EV chargers on campus. To join the ChargePoint network, click here. Once registered, you can request a ChargePoint card be sent to you in the mail or use your smartphone to initiate a charging session. General public pricing is $2.50 for hour for level 2 and $1.50 per hour for level 1. For a map of the charging locations, click here. 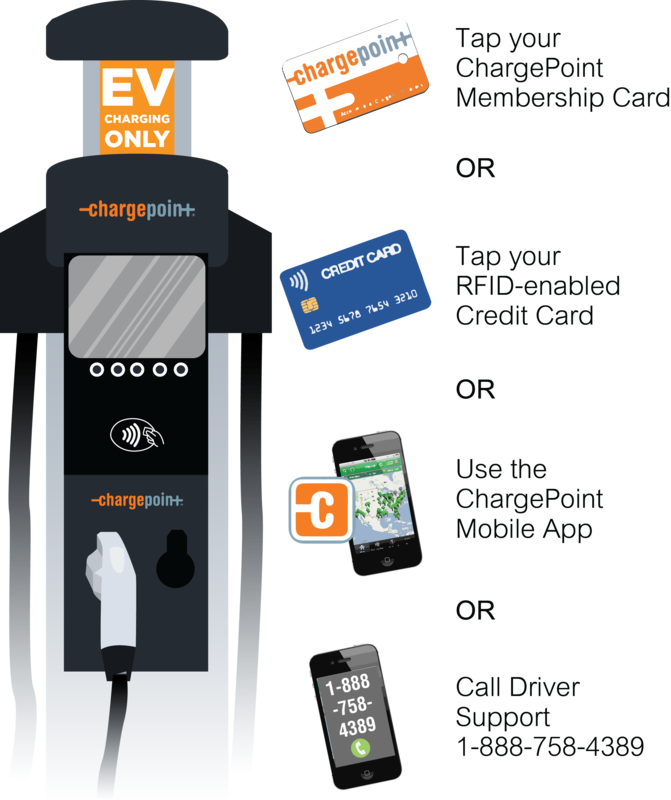 You may start a charging session by one of several methods: tapping your ChargePoint access card on the start screen, through the ChargePoint mobile app, or by calling driver support at the toll-free number listed on each ChargePoint station and on the back of your ChargePoint card.You may also start a charging session by tapping your RFID-enabled credit card on the ChargePoint start screen. Only sessions using a ChargePoint access card will receive the UCI discount. Vehicles must be actively charging when parked in EV stalls. There is a maximum charging time of 4 hours at any level 2 charging station. When parking in the marked EV stall, a valid UCI parking permit must be displayed at all times. Permit dispensers are located in the parking area near the stations. UCI is the 1st university to offer complimentary mobile electric vehicle charging! Stranded vehicles of UCI faculty, staff, students, and visitors will be provided with enough power to safely reach the nearest on-campus charging station. Mobile electric vehicle charging is part of our VIP Service, a motorist assist program that is provided at no charge to all UCI affiliates and visitors. It is available daily, between 7am-11pm, excluding campus holidays. Service limitations may apply. Call (949) 824-VIPS (8477) for assistance. Over 178 electric vehicle charging ports are open to the public and available in Lot 16, Lot 1C, 70, Anteater Parking Structure, Mesa Parking Structure, Social Science Parking Structure, Student Center Parking Structure, and East Campus Parking Structure. In 2011, eight Level 1 & 2 ChargePoint charging stations were received through grants to foster the adoption and readiness of electric vehicle infrastructure throughout the United States. The grant was made possible by the American Recovery and Reinvestment Act through the Transportation Electrification Initiative administered by the Department of Energy to accelerate the development and production of electric vehicles to substantially reduce petroleum consumption, reduce greenhouse gas production, and create jobs. An additional 20 Level 2 electric vehicle charging stations that are part of the Irvine Smart Grid Demonstration Project were installed in the Anteater Parking Structure in 2013. This public-private partnership is led by Southern California Edison and the US Department of Energy. Recently upgraded, these stations require activation by a ChargePoint access card or by calling the toll-free number found on the station. These stations are complimentary through Winter 2016. Six ChargePoint ports are installed in Lot 16 near Building 423 as of December 2014. These EV stations are part of a demonstration project funded by the California Energy Commission and the South Coast Air Quality Management District that will be examining how pricing affects charging behavior. Two ChargePoint ports are also located at the Public Services Building in Lot 1C. In spring 2016, six additional ports were added to the Social Science Parking Structure and four were added to the Mesa Parking Structure to meet increased demand for level 2 charging.